Real Homes is a handcrafted WordPress theme for real estate websites. It offers purpose oriented design with all the useful features a real estate website needs. Real Homes theme facilitates its user on front end as well as on admin-side and makes properties management a breeze. Interested in Using OpenStreetMap? Check Out Related Demo! Advanced properties search provided in Real Homes theme is powerful and fully customizable to fulfill various needs. You can select which fields you want to display and what data will be displayed in those fields. You can display multiple location fields to provide search behavior like State > City > Area. You can change the values of price fields. You can modify the search behaviors and values for beds and baths fields. In short you can fully customize the search form to match your own needs. Real Homes theme supports up to 4 location dropdowns to produce search fields like Country > State > City > Area. These dropdowns works for locations hierarchy automatically. The numbers and labels of these dropdowns are fully customizable from customizer settings. Search form over image module can be enabled for homepage to replace slider area with a graceful looking search form over a background image. Real Homes also provides related customizer settings to fully customize image, search form fields, text, colors and margins. Real Homes includes Google Maps API integration that enables you to display Google Maps with properties markers on search results page, properties display pages, property detail page, home page, Contact page and taxonomy archive pages. Real Homes theme includes compare properties feature that allow your website visitor to add properties to a compare pool and later on compare those properties side by side. Visitor do not need to login to use this feature. Check out theme demos for real experience. 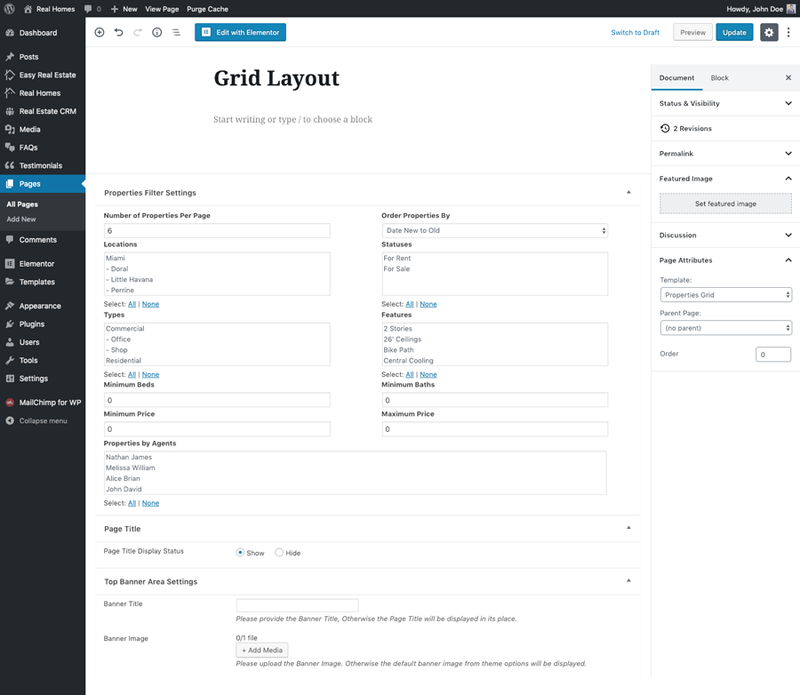 Real Homes theme provides page templates to display properties in list layout and grid layout. 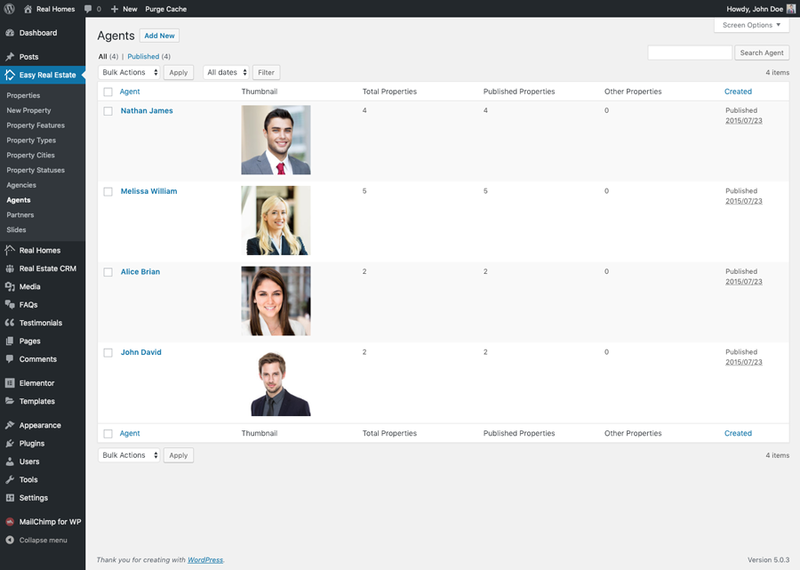 These templates are also supported with meta boxes to filter and sort properties based on your requirements. So basically you can create any type of custom list of properties based on your own custom criteria. Real Homes provides multiple templates to display your properties in the form of a gallery. Each template contains a quick filter based on property statuses. Real Homes theme provides a wide set of customizer settings that will help you configure and customize stuff around your website more easily. You can customize the price format to any currency in the world. You can customize the URL slugs to your required ones. You can customize all the important stuff related to your website using customizer settings and without going into code. Real Homes provides a rich set of meta boxes that are super easy to use. The goal of these meta boxes is to make it easier for you to add and modify a property. Real Homes provides an easy to use interface to add/modify/remove additional details related to a property. This feature can be used in many ways especially to add a certain type of information for which there is no other meta box available. You can add floor plans related to a property using an easy to use interface provided on property add/edit page on admin-side. You can provide various types of files ( pdf, office documents, images etc ) as attachments to a property. Real Homes theme provides similar properties module on property detail page which displays properties similar to current property. Real Homes theme provides a sub properties module on property detail page to display any sub/child properties ( like apartments in a building ). Each child property works as a full property independently. Real Homes provides Google reCAPTCHA API integration support on all the contact forms in theme to prevent spam. You can provide user registration, login and forgot password features on your site to let users access member only features. Real Homes comes with simple login and registration features from start but Social Login feature was introduced in version 2.6.1 and allow you to integrate any social network with your website for this purpose. Consult the related section in documentation for more details. This theme provides front end property submit template and related configurations. So you can restrict certain level of users from accessing administrator dashboard and provide them an interface on front end to submit properties. Later on website administrator can review and publish the submitted properties. You can also configure the settings to auto publish a property as soon the user pays a certain fee. Since Real Homes version 2.6.0 you can show/hide any field on property submit form. This will help you hide the fields you think you do not need on your website. 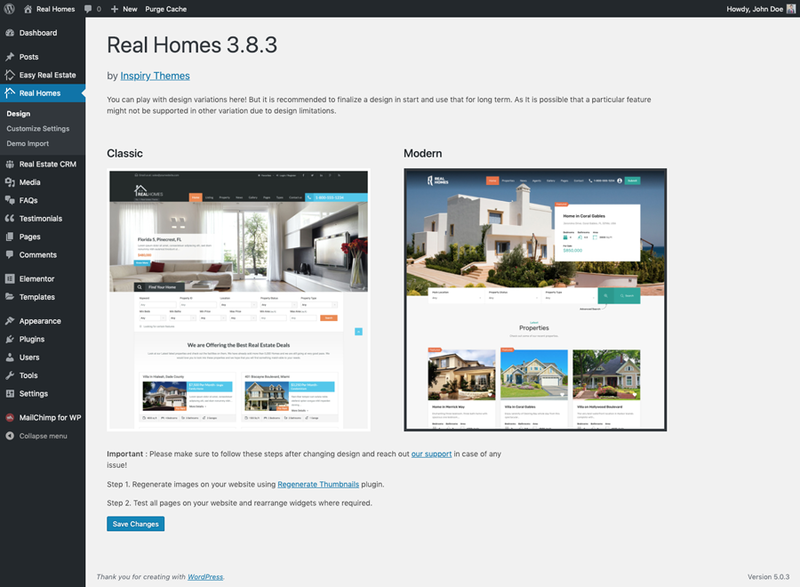 Real Homes theme provides a template to display properties related to current user on front end. This template can be used to preview property, edit property, make a payment for property or even removing a property. A user can pay through paypal to get his submitted property published. Payment feature can be enabled or disabled from customizer settings. A visitor can add properties to his favorites collection, So that he can visit his/her favorites properties later on. Visitor do not need to login to use this feature as if he/she is not logged in then the favorite properties information is stored in cookies. But if the user is logged in then this information is stored in database as user meta. 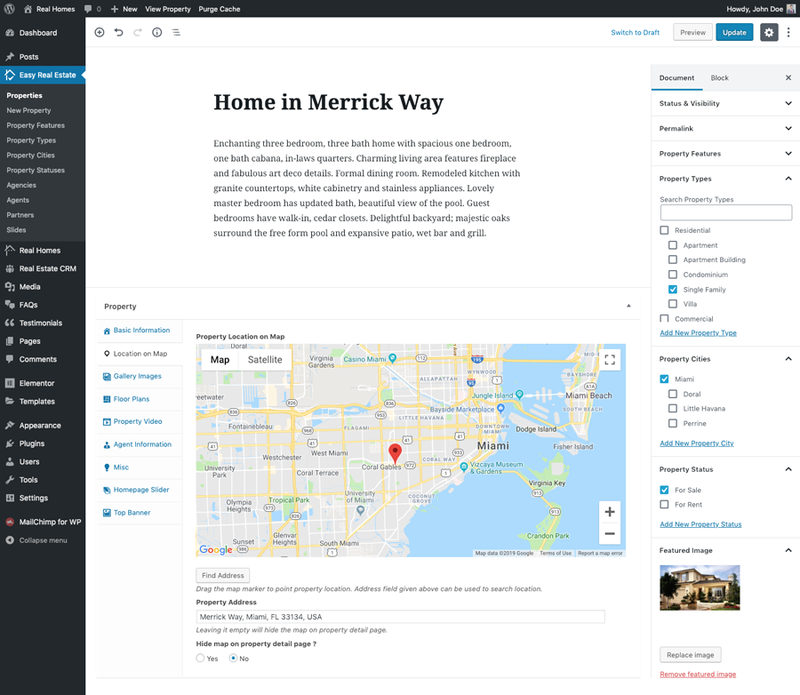 Real Homes theme provides a front end profile edit page. This page enables a user to edit his profile information without going to dashboard. A user can later on choose to display this information with his submitted property as agent’s information is dispalyed in theme’s demo. Real Homes theme provides FAQs support using Quick and Easy FAQs plugin developed by Inspiry Themes. So you can add FAQs to your website and even make them filterable. Real Homes theme is translation ready and you can translate it to any one language ( LTR or RTL ) without the need of a plugin. But, If you want to build a multi language website then you can use a plugin like WPML with this theme. Real Homes is compatible with iHomefinder Optima Express IDX plugin and you can test its Classic Demo and Modern Demo. Please note that Real Homes theme supports iHomefinder Optima Express IDX plugin as an additional feature. So, it is a complete theme even without iHomefinder Optima Express IDX plugin and that plugin is not required for basic functionality of this theme. Kindly check out screen shots to understand what this theme offers without iHomefinder Optima Express plugin. You can add, modify, remove, search and list properties with the basic features of this theme and without any extra plugin. This theme is compatible with dsIDXpress plugin and you can test its Classic Demo and Modern Demo. Please note that Real Homes theme supports dsIDXpress plugin as an additional feature. So, it is a complete theme even without dsIDXpress plugin and that plugin is not required for basic functionality of this theme. 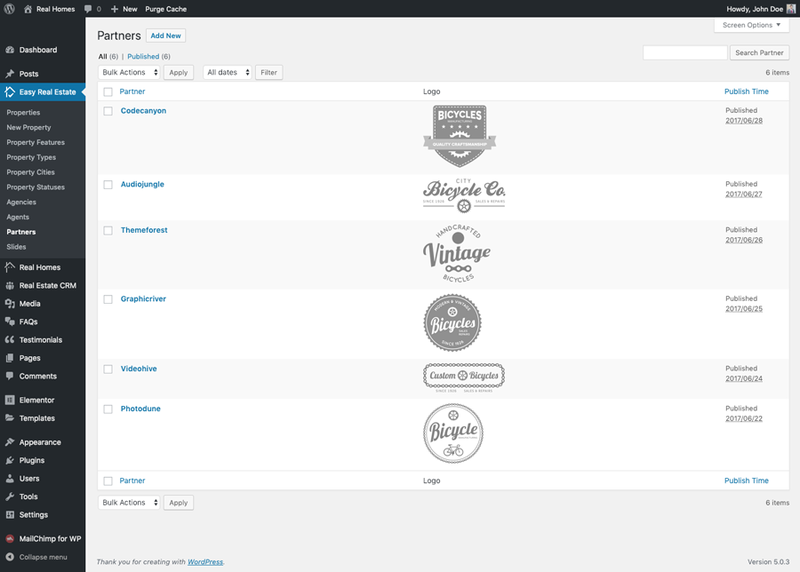 Kindly check out screen shots to understand what this theme offers without dsIDXpress plugin. You can add, modify, remove, search and list properties with the basic features of this theme and without any extra plugin. You can build any type of slider using Revolution Slider plugin that comes included as part of this theme’s main pack. If you only want to use properties slider then there is already a slider available for that. Real Homes theme main package contains a ready to use child theme to make it easy for you to get started with modifications and keep updating the parent theme whenever the new update becomes available. 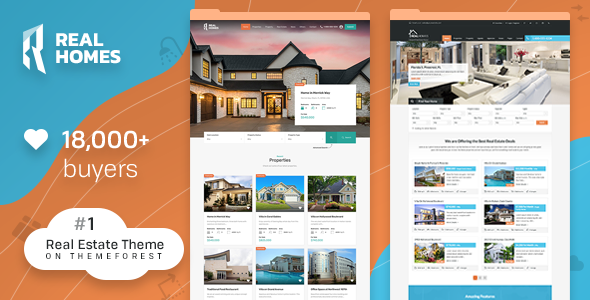 Real Homes theme provides one click demo import feature to help you quickly setup your site like the theme demo and learn all the things by observing how those are done on demo site. Real Homes theme provides an easy to understand but detailed documentation. It will guide you at almost every step, Either it is a configuration OR adding some sort of contents OR installing a compatible plugin. Real Homes theme provides various custom widgets like Advance properties search widget, Feature properties widget, Featured properties related to a particular agent and property types widget. We have multiple agents in our agency and we want our agents to add properties. But we do not want to allow anybody else to register, So what is the solution for this ? A real estate property is like a post in WordPress and You need to simply create users for your agents with author role. You can know more about roles from https://codex.wordpress.org/Roles_and_Capabilities . So, You do not need to enable registration for public and manually added users with author role will be good enough to add properties using WordPress dashboard. You can pass documentation’s add property link to your agents for guidance. How to create RSS feed for properties ? and How to send its email to potential customers. Later on you can use Google feed burner http://feedburner.google.com/ and create a feedburner widget on your website for people to subscribe. How can I import properties from my existing database using XML or CSV files? You can import properties into Real Homes theme for free using WP ALL Import plugin and it’s add-on for Real Homes theme. For more details you can consult this knowledge base article. We have dedicated support staff and support for all our themes is provided through our support site. Visit our Support Site | How to get Item Purchase Code ? Added – WhatsApp share option for property. Added – Color settings for modern sticky header. Added – Setting to change Agent word on modern property detail page. Improved – Property gallery slider for modern to better handle portrait images. Improved – Share by email option for modern. Improved – Contact page’s address field support for HTML tags. Fixed – Property colored label support for modern properties search results. Fixed – Properties count on modern my properties page. Fixed – Map info window on classic property detail page. Fixed – Wrong phone number bug in classic that appears on iPhone. Removed – Google+ share option with respect to Google policy. Improved – Couple of other minor things. Fixed – Header styling issues from customizer. Fixed – Console messages due to duplicate form IDs. 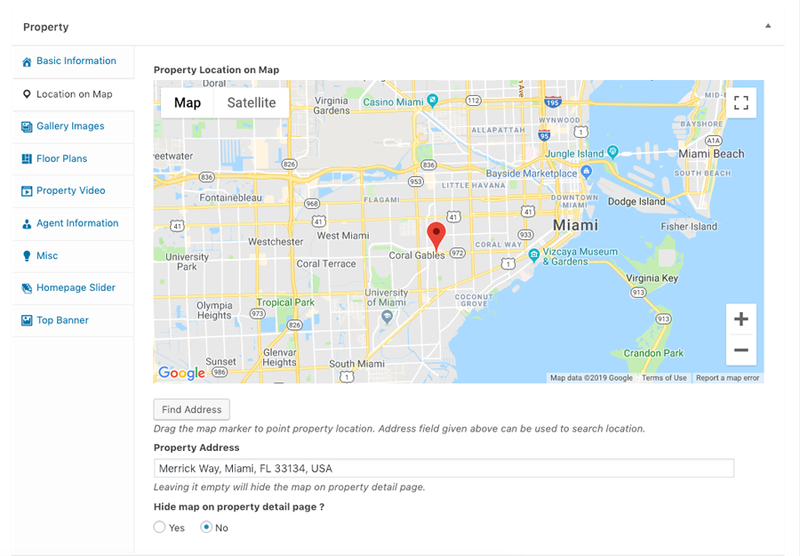 Fixed – Submit property template’s location field appearance. Fixed – [Any] option repetition bug in location search field. Important Note: We have made a directional change in development of Real Homes theme and moved plugin territory functionality to a new plugin named “Easy Real Estate”. So make sure to install and activate it after this update. Normally you will get an auto install message that you can follow, But if you have dismissed plugin install dialog then this might not appear for you. So make sure to install it by visiting Appearance > Install Plugins page. Also make sure to re-save permalinks settings after this update to avoid 404 errors. Major Addition: Added Elementor Page Builder Support and provided 14 Real Homes based widgets that can be used on any page. Added – 2 new Elementor based demo imports. Added – Two new header design variations for Modern. Added – Transparent and Solid header design options for responsive header in Modern. Added – New full width property detail page layout for Modern. Added – Full width properties grid template for Classic and Modern. Added – Half Map with properties layout support for Classic. 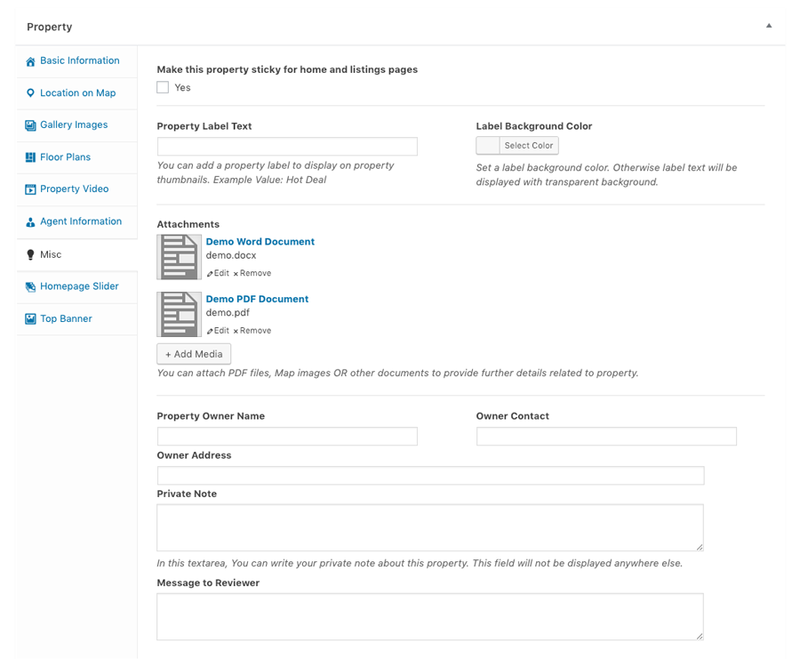 Added – Floor Plans support for front end property submit form. Added – REST API support for Property and related meta. Added – REST API support for Agent and related meta. Added – REST API support for Agency and related meta. Added – Sticky header support for Modern. Added – Retina logo support. Added – Retina logo support for partners. Added – Banner support for Modern homepage. Added – Option to switch phone icon with WhatsApp icon in header. Added – More customizer settings to further help with customizability. Improved – Property featured image rendering in Google Maps information box to improve maps performance. Improved – Compare properties module to display message when more than 4 properties are added to comparison. Improved – WPML language switcher support for Modern. 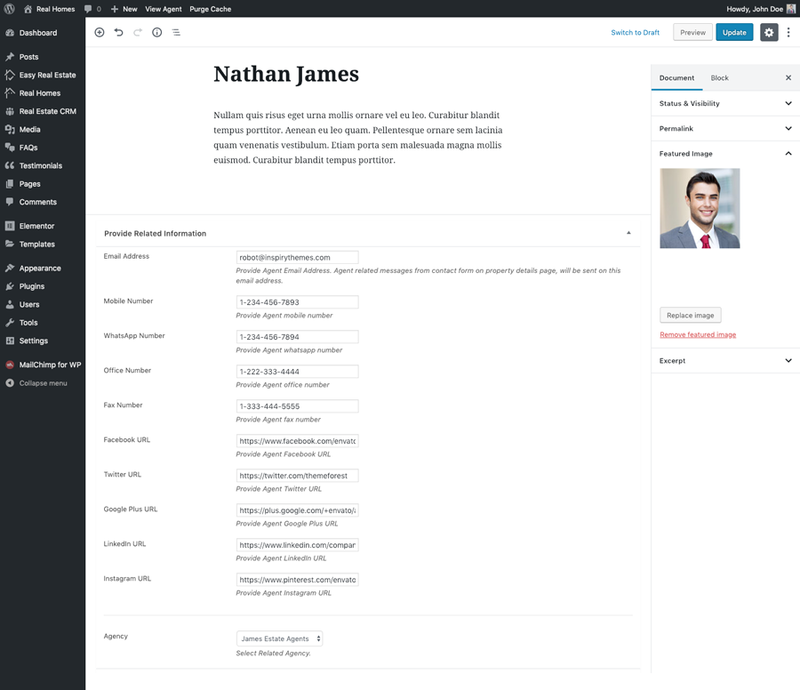 Improved – Mailchimp for WordPress styles for overall theme. 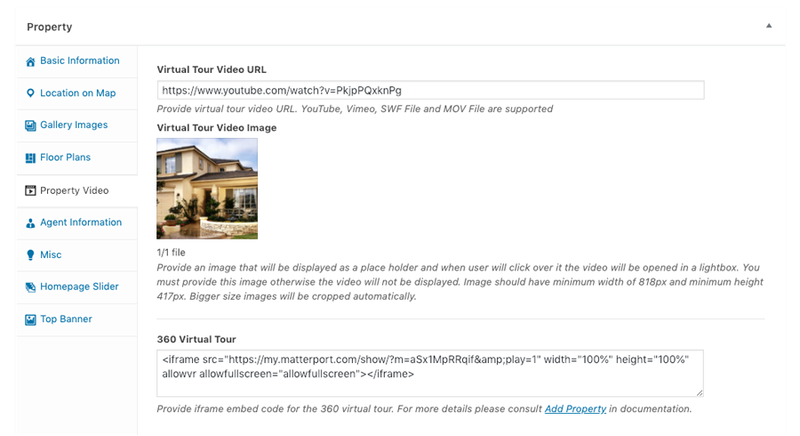 Improved – Property detail page’s gallery code. Improved – Various other minor things across the theme. Fixed – OpenStreetMap’s appearance bug in meta boxes. 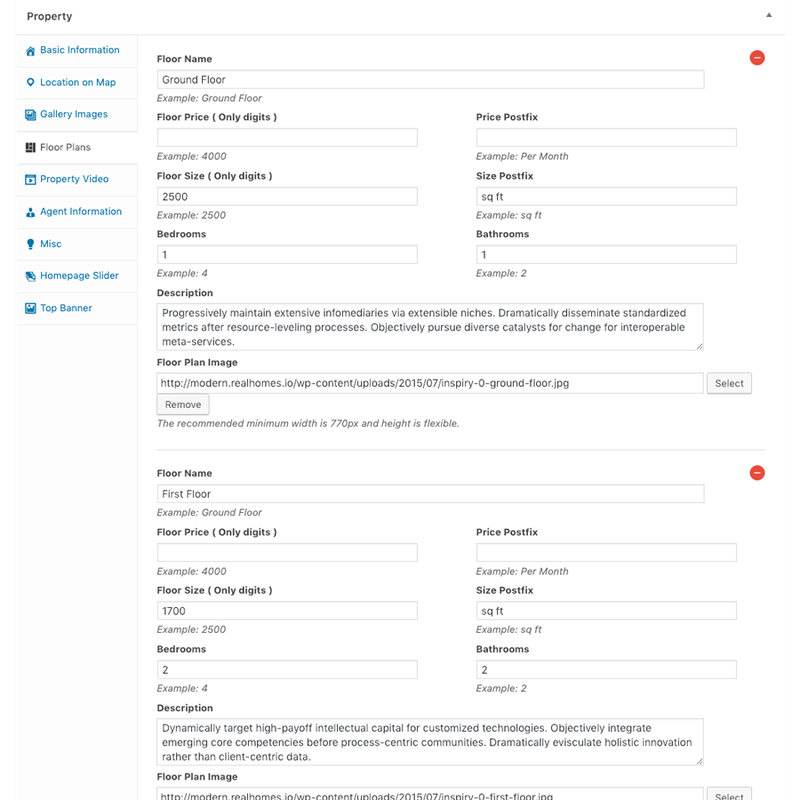 Fixed – Prices fields bug for Search Form Over Image in Classic. Fixed – 4 columns search results template’s grid styles issue. Fixed – Price postfix bug on front end property edit page. Fixed – dsIDXpress styles inconsistency that appeared after their recent update. Fixed – Various other minor issues that are hard to track in such a big update. Tested with WordPress 5.0 ( RC3 ) and fixed related issues. Fixed search form over image section’s price field issue. Developed a purpose oriented CRM ( Customer Relations Management ) Plugin for Real Homes to help our customers get more out of their business leads. Added – drag & drop fields manager for search form. Added – property features field support for Modern search form. Added – customization option to display custom number of fields in top row of search form ( Modern ). Improved – Property print styles and added QR code support. Improved – Property submit code to not accept empty values in additional details. Improved – Various minor things across the theme. Major improvements in Classic’s blog layout. Added – Thumbnails based property images slider support for Modern. 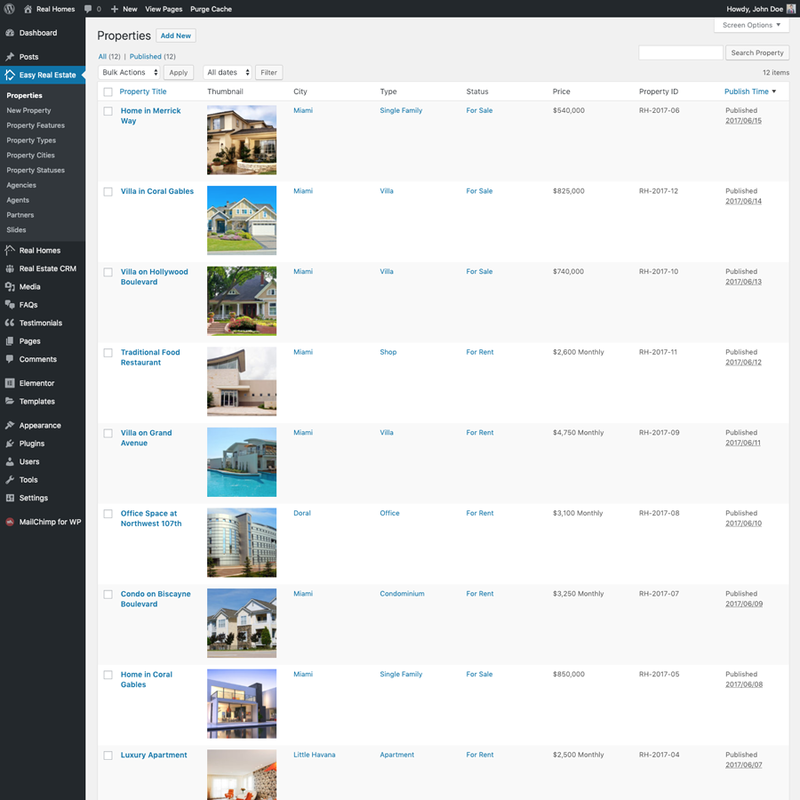 Improved – Modern properties search results page to have layout without map. Improved – WPML Language switcher for both design variations. Added – Spanish language translation files pack ( Human Translated ). Added – French language translation files pack ( Human Translated ). Added – Italian language translation files pack ( Human Translated ). Added – German language translation files pack ( Human Translated ). Added – Portuguese language translation files pack ( Human Translated ). Added – Turkish language translation files pack ( Human Translated ). Big Addition: Added OpenStreetMap support for all map places in Modern & Classic. 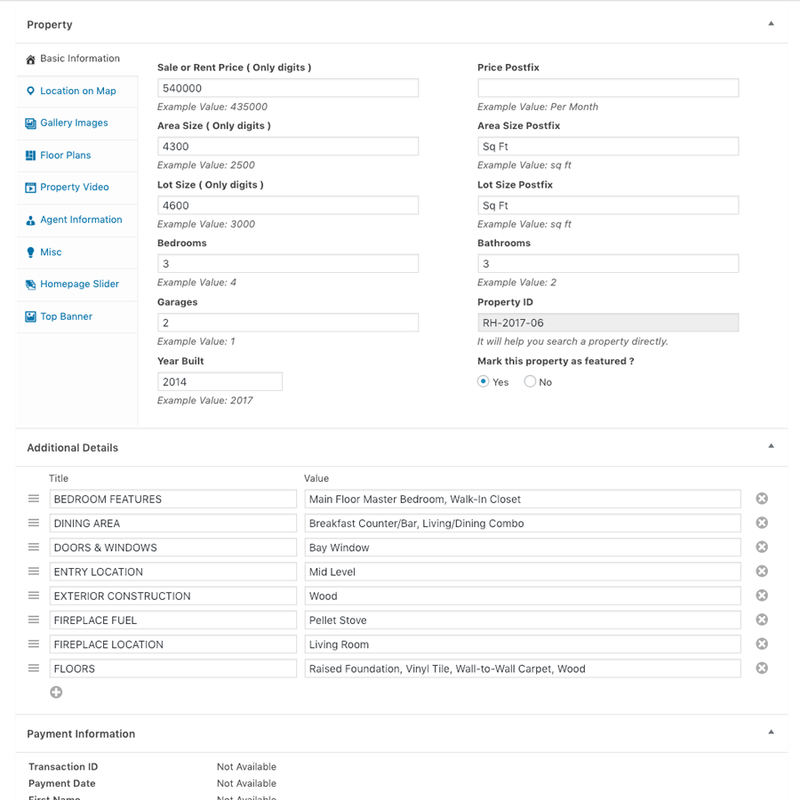 Including admin side property add/edit page and front end property submit and edit page. Added – Homepage sections manager for Modern. Added – Blog/News sections for Modern homepage. Added – Ajax based pagination for homepage properties in Modern. 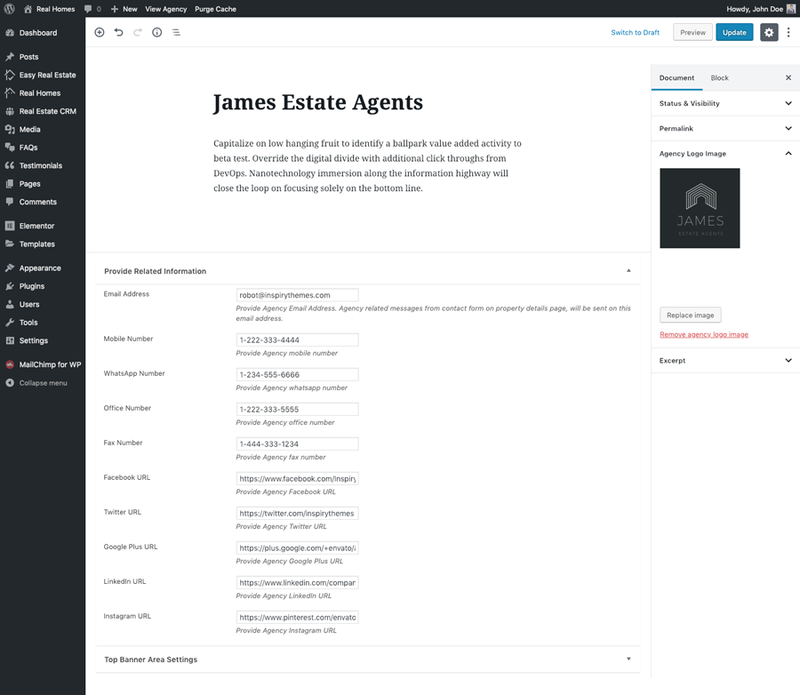 Added – Ajax based property removal for My Properties page template for Modern & Classic. Added – Custom text color and background color options for homepage sections for Modern. 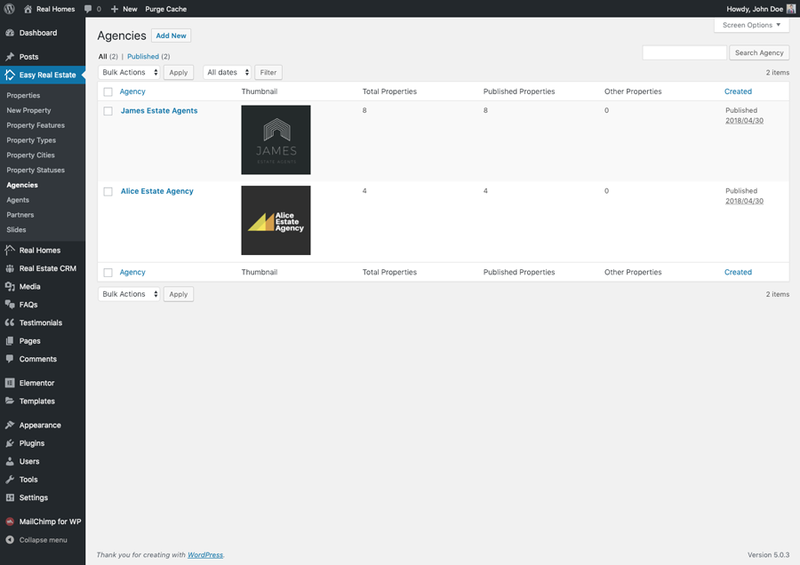 Added – REST API support for property, agent, agency and partner post type and related taxonomies. Added – Multiple new translation files to cover certain parts of theme. Like separate file for Classic and Modern etc. Fixed – Duplicate reCAPTCHA on agent single for Modern. Fixed – Mailto link on agent single for Modern. Fixed – Display Email’s inconsistent behavior on Contact page for Classic. Fixed – Inconsistent behavior of featured properties on top option in search results for Modern & Classic. Fixed – Special character decoding issue for property marker mouse over title in Google Map. Improved – Search form over image section for classic by adding parallax to it. Improved – Maps related code in overall theme. Improved – Titles and headings markup of pages and posts. Improved – Meta boxes code especially related to property. Improved – Maps related customizer settings and moved them to a separate section under main panel. Improved – Contact related customizer settings and moved them to a separate section under main panel. Improved – Google reCAPTCHA related customizer settings and moved them to a separate section under main panel. Improved – Various other things related to Customizer settings. Improved – Homepage code for Modern especially with respect to RTL and Parallax. Improved – Homepage slider for mobile devices. Improved – Dropdown select box styles. Improved – WPML configuration file. Improved – SVGs in couple of places. Deprecated – Quick CSS customizer setting. Photos used in this theme are for demo purposes only and are not included as part of the theme license.